Impressionist paintings are today among the most admired of all art-works. They are the pride of every public and private collection. As a rule they possess a magic that captivates the connoisseur and the less experienced art lover. 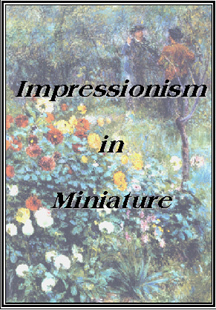 The miniatures devoted to art in my collection cover a range from a gallery, a studio and the interior of an Impressionist’s home. They represent the two most well known of the artists and their devoted art dealer. All rooms are in 1/12th scale and have been placed into the wall of the room housing Twin Manor. 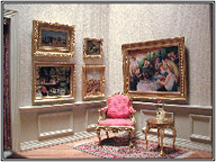 This miniature art gallery was inspired by the work of Paul Durand-Ruel and is patterned after the galleries in France in the late 1800s. Durand-Ruel devoted his life and energy to the Impressionists. From 1870 onward, with the help of his sons Joseph and Georges, he bought most of the work they produced. Durand-Ruel was a pioneer of modern gallery practices. In 1891 he mounted a long series of solo shows that finally secured the Impressionists' reputations. The gallery's main room features various sculptures and paintings. There are a total of fifty-five paintings in the gallery, including those in the shipping room. One of the sculptures is a scale copy of Degs's Little Dancer at Fourteen. Displayed in the office are a desk and chairs from the era. The documents on the desk are reduced copies of an actual bill of sale and inventory record of the Durand-Ruel Gallery in Paris dated 1873. Featured are oil paintings of Luncheon of the Boating Party after Renoir and On the Beach after Boudin by the artist Paul Saltarelli. All other paintings in the gallery are computer generated. The floors are cherry laid in a herringbone pattern typical of the period. The walls are papered with a textured paper to resemble fabric. The gallery is lit by a sky light. The back room was used for preparing paintings for shipping and storage of paintings waiting to be claimed by their buyers. Pierre-Auguste Renoir (1841-1919) had studios at seven different locations in Paris during the 1860s through the year 1900 but no photos exist of them. 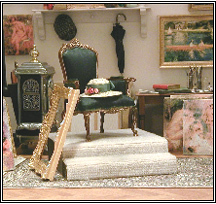 (The only existing photos of his studio are of his last one in Cagnes) This miniature is a composite of how a typical artist's studio in Paris would have looked at that time. All paintings are after Renoir. Most were on the top floor with sky lights and had northern exposure windows. Furniture was at a minimum. Most of the space was used for paintings and unfinished canvases. Renoir was best known for his portraits. Models posed in his studio and used various props such as the hat on the chair. Backgrounds were often rather blurred or simply a curtain. On the left wall hangs the painting of his close friend and fellow artist Frederic Bazille seated at his easel. The unfinished painting is of another Impressionist painter Berthe Morisot and her daughter. The stove in the back corner is typical of the type used at the time. Against the back wall is a table of extra brushes, reference books and unused and unfinished canvases. The hat is in the style he used and hangs near a silk umbrella. 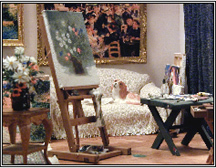 This view of the studio shows the artist's working easel and a still life painting of flowers in progress. On the little table are tubes of paint, brushes and a palate knife. A second copy of Le Moulin de la Galette hangs on the back wall. The view from the window is of Paris showing a typical array of buildings. On the right a box of paints rests on a folding stool that was used when artists painted en plein air. Giverny become Monet's (1840-1926) home when he moved there in 1883. As his finances improved he was able to purchase the home in 1890 and began many changes. He lived there with his second wife Alice, her six children and his own two sons. It was his home until his death. 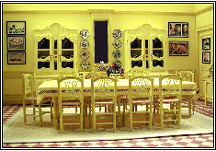 The house was decorated with typical early 19th century Normandy furnishings and the walls were painted with clear strong colors. The house and gardens of Giverny have been restored and today the visiting public can get a glimpse into the private life of Claude Monet. Crystal wine decanters stood on one of the sideboards. Mostly clear glass was used since Monet thought that colored glass made the wine appear unappetizing. His preferred white wines, especially Sancerre. Two matching Normandy style china cabinets were along the back wall and were filled with the family collection of blue and white china. When Monet entertained special guests his wife preferred to use a white porcelain set of dishes with wide yellow rims and a border of blue. Fifty plus Japanese prints in simple black frames hung in the dining room on chrome yellow walls. Blue and white tiles surround the fireplace. The floor in this miniature room is canvas as opposed to the ceramic tile in the full size house. The kitchen was an extension onto the house next to the dining room and was decorated in light blue with a darker blue trim. During Monet's time there were no curtains at the kitchen windows as he wanted his wife to be able to view the gardens. The kitchen gleams with the blue and white Rouen tiles that cover the walls. Every utensil had its place and a table was set aside just for making pastry. The large cooking range was the focal point of the kitchen. Fueled by wood or coal, it was placed between the window and the fireplace so that fumes could be directed out of the room. The tiles above the range were of different designs than the rest of the kitchen and were a later addition.